November | 2016 | Relaxed. Transitioning. Natural. Beautiful. Prepare a double boiler (i.e., as if you were tempering chocolate). 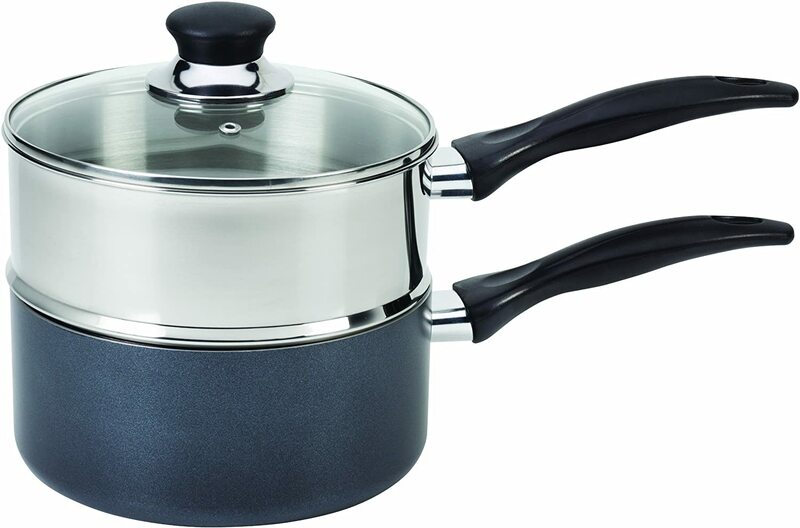 If you do not have a double boiler, you can create a makeshift one by placing a Pyrex glass bowl or stainless steel bowl over a pot filled ¼ to ½ of the way with water. Bring the water to a boil, then reduce to a simmer before adding ingredients. For all my fellow foodies out there, you already know that this method, much like the protective cooking it provides when preparing something with delicate ingredients (e.g., whisking up an egg-based sabayon), will help to prevent the recipe components from the dangers of direct heat. This, in turn, preserves the integrity of our ingredients. Add 2 TBSP of sweet almond oil. Used since biblical times, almond oil is easily absorbed by the skin and helps to alleviate dryness. It also combats future acne, due to its high vitamin A content. Add 1 TBSP of apricot oil. Apricot oil softens hair and helps to soothe irritated skin. Add 1 TBSP of organic beeswax. Beeswax has anti-allergenic and anti-inflammatory properties. It helps to trap moisture into the skin and hair and also promotes healthy hair growth. I like to use the pastilles for easier (and faster) melting. 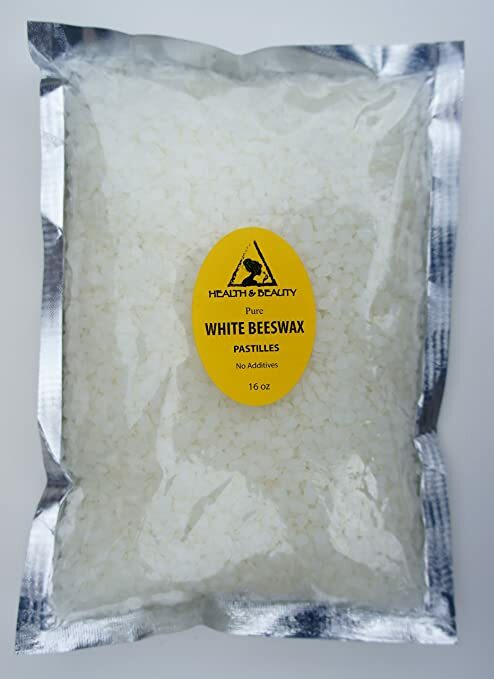 You can purchase yellow or white organic beeswax pastilles, depending on your preference. I like the white pastilles because it doesn’t overly saturate my product with color, but either are fine. The yellow beeswax is in its raw, unadulterated (aka unbleached) form. The white pastilles are filtered and lightened. Just make sure they are chemical-free (collected from unsprayed and unfertilized fields) and are bleached naturally (i.e., via air and/or sunlight). Add 1 TBSP of pure castor oil. Due to its antibacterial and antifungal properties, castor oil helps to treat acne, rashes, and other skin conditions.Just make sure it is hexane-free and cold-pressed. This oil is high in vitamin E, minerals, proteins, and Omega 6 and 9 fatty acids. Its unusually high ricinoleic acid ratio makes castor oil the supreme oil of choice for expedited hair growth. Add ½ teaspoon of vitamin e oil. Vitamin E oil has anti-aging properties that prevent the damaging effects from the environment (e.g., free radicals). This nutrient-rich oil heals and repairs skin and hair. Vitamin E is an antioxidant that helps to extend the shelf life of the balm. I prefer to buy Sundown Naturals’ vitamin E oil. Add 15–20 drops of essential oil. I used 10 drops of cedarwood essential oil for its ability to remove toxins and reduce hair loss. I also used 10 drops of eucalyptus essential oil for its antiseptic and aromatic properties as well as its ability to ward off itchy skin while increasing follicle stimulation. However, you can use any essential oil you prefer (i.e., rosemary, peppermint, etc). Transfer the liquid into a container of your choice, and enjoy! 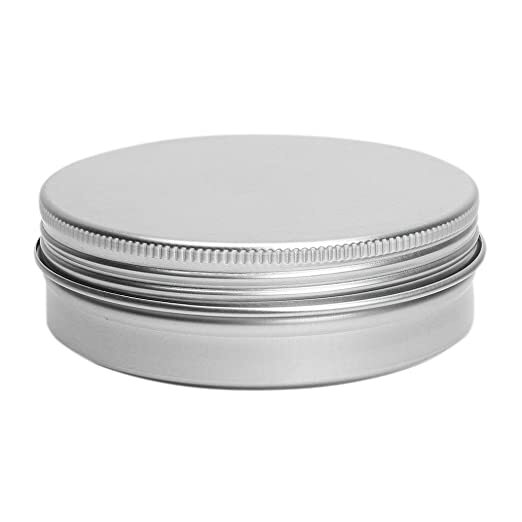 I purchased 100 ml tins (for gifting purposes) and added a custom label that I designed, but you could use any container you like that has been cleaned and sterilized. 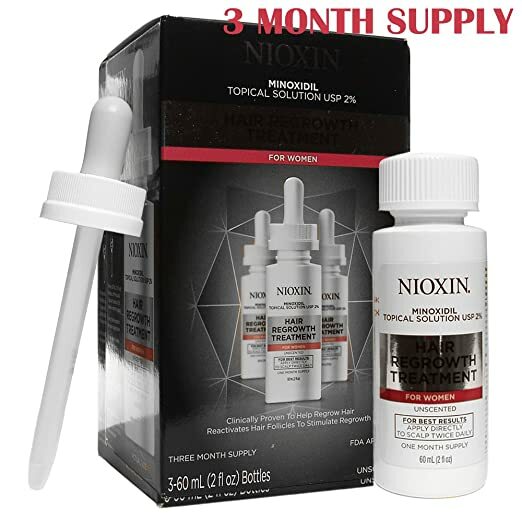 Nioxin 2% Minoxidil Hair Regrowth Treatment for Women has been clinically proven to effectively help hair growth in women. It is the only FDA-approved medicine available to treat female pattern baldness and thinning. According to the label, it “reactivates hair follicles to stimulate regrowth.” Although previously only available by prescription, it is now comes in a 90-day supply for under $40 online. Since a 30-day supply is almost $17, that’s essentially a buy 2, get 1 free deal! So, I think this gives great bang for your buck. Directions: Apply one mL 2 times a day directly onto the scalp in the hair loss area. Manufacturer Warning: According to the enclosed instruction leaflet, using more of the Hair Regrowth Treatment or using the Hair Regrowth Treatment more frequently WILL NOT improve results. If treating extreme hair loss, continued use is necessary or hair loss will return. Also, it is important that, when using this treatment, it is not applied on other parts of the body. Contact with the eyes should be avoided. (In case of accidental contact, rinse eyes with large amounts of cool tap water.) In addition, some people have experienced changes in hair color and/or texture after using this product. In just two weeks, I noticed a significant increase in my hair’s volume and that my sparse edges were starting to fill in. Around this time, while having lunch with my sister, she commented that my hair looked “healthy.” After a month, she said that my hair appeared twice as thick and full as before! This was without her knowing that I was using this treatment. I noticed a difference, but it’s nice when the people around you start to notice, too. All in all, I am pleased with the fact that this Hair Regrowth Treatment helped to thicken my hair and grow back my edges. However, it didn’t seem to have much, if any, effect in terms of expediting my hair growth. Watch the video below to see my detailed progress after using the Nioxin 2% Minoxidil Hair Regrowth Treatment for a month. A mousse for fine, limp hair? Count me in! 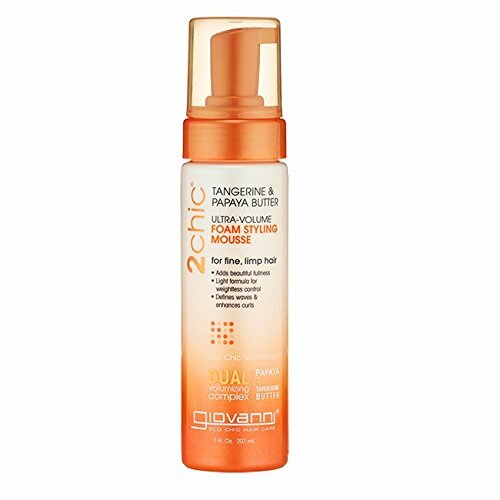 Giovanni’s 2chic Ultra-volume Foam Styling Mousse with tangerine and papaya butter smells ahhmaaaazing! It has an intoxicating scent that isn’t too overpowering. It claims to add fullness while defining waves and/or enhancing curls. In addition, it offers a light formula for weightless control. I love the applicator bottle. A little goes a long way because it is a foam styling mousse. So, you definitely get a lot of bang for your buck! However, I felt the mousse alone was quite drying, despite all of the amazing ingredients. Although tangerine and papaya contain vitamins A and C and are rich in antioxidants, they also have clarifying properties. I think this is why my hair felt so dry when I used this mousse as a standalone product. For instance, I could use my Pantene Pro-V Silky Moisture Whip by itself without ANY additional add-ins. However, it has become impossible to find locally. I tried for over 2 years! (Sigh.) And, when I finally found it online, it was listed for DOUBLE (and sometimes as much as TRIPLE) the price! As a result, I have been on the look-out for a replacement product.